Basically, Mike made a gluten-free chocolate cake. The cake smelled great, looked great in the pan but he did not let it cool before knocking it out of the pan. Long story short, he improvised and salvaged our dessert. This dessert was made for the same friend who’s power went out and we invited over. Check out my post called ‘Bro, Do You Even Cook’ to see what our main course was! What you see in the photo here is our dessert lined up and ready to serve. 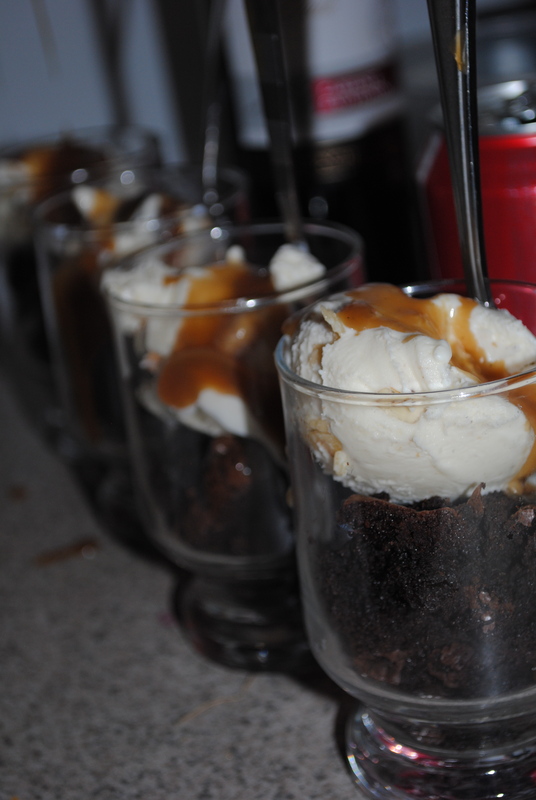 In each glass is (starting from bottom to top) a layer of ‘chocolate cake/brownie mistake’ – 2nd layer is vanilla bean ice cream and to top it off I whipped up a quick salted caramel sauce and drizzled it over top. Thanks to Mike’s quick thinking dessert was saved!